Hola people! After a short vacation I am back with another review from one of my most favorite skincare brand – Innisfree, which you may know is a Korean brand. 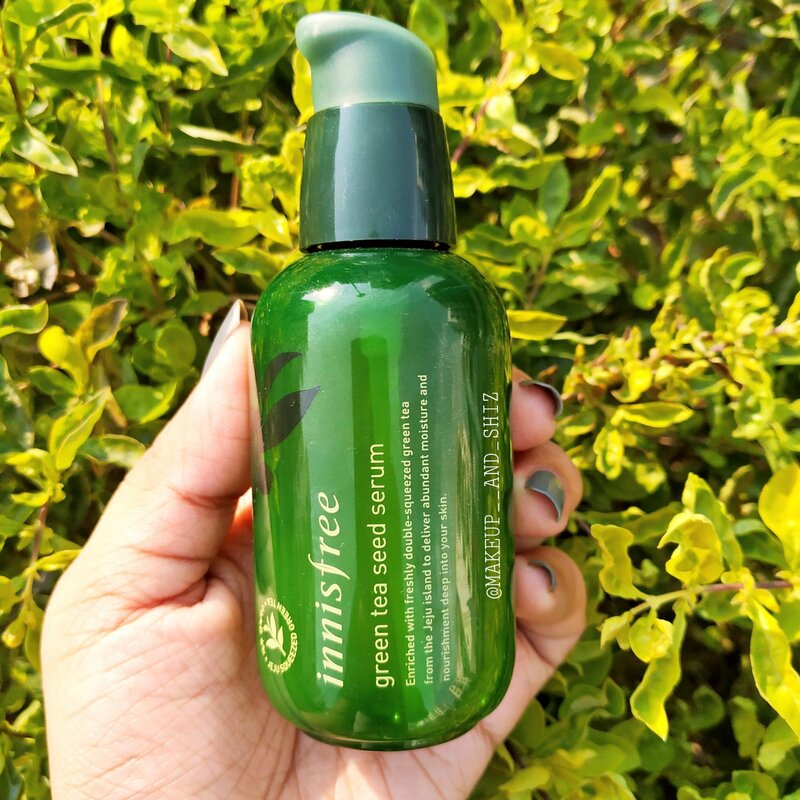 I will be reviewing their much hyped product – Innisfree green tea seed serum. It comes in a green bottle with a pump and a cap with it. The bottle is made out of plastic and hence very travel friendly , doesn’t leak. The formula of this serum is very liquidy or or watery . Hence it is very runny. It is slightly bit viscous than water and colourless . It smells more or less like green tea. Read also :Garnier sheet mask — Review, India. I really love this serum, to be honest. My skin is extremely dry and this gives me perfect hydration . With almost a week of use my skin started purging (Skin purging occurs when a new skin care product causes a breakout). But after that my skin started relaxing and it got so better . My skin felt very hydrated , gave me a glow on my face with regular use. It gave me a smooth skin and healed my dry patches. I used it once daily (1-2 pumps ) after toner, before moisturizer. If you use an essence , use serum after using essence. Yes off course. Though it’s tiny bit expensive, I would still love to purchase this again. Yes. I would recommend to all skin type. It would suit sensitive people very well too! If your budget supports you, go for it. Read also : Dot & Key Underarm Colour Correction Serum– Review. May not be very hydrating for extremely dry skin. That was all for this post ! I hope you all like it. Have you tried anything from Innisfree ? If yes, comment down and let me know ! Next Plum Goodness E-luminence Deep Moisturizing Creme – Review. This sounds like a decent product my oily skin could use. Even I do find it a bit expensive though! Yes. Its really expensive. Also that 160 ml is 2500 and 80 ml is 1950 . You could get a sample instead , if it suits you , buy the 160 ml one.